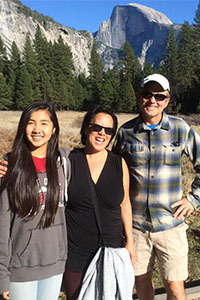 Preserving open space in the Ojai Valley improves the quality of life for all of us. That’s why we support the Ojai Valley Land Conservancy personally, and through Wild About Ojai, encourage our customers to as well. We are a wife-and-husband team backed by a team of dozens of professional culinary, service, and bar staff. 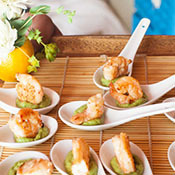 We bring to you 25 years of experience in catering and event planning. Lorraine and her staff are responsible for sourcing and creating all the wonderful dishes for your guests while her husband Glenn and his team handle logistics and planning as well as “front of the house” operations on your special day. When you hire Lorraine Lim Catering for your special event, you can relax knowing that every detail is being handled by our experienced team of food and event professionals. 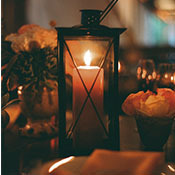 It is our pleasure to be of service in all aspects of planning your special event. While we specialize in catering, we are also happy to arrange rentals, lighting, sound, entertainment, and all the logistics to ensure your event is a success! 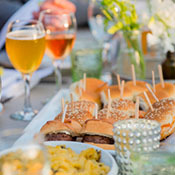 We bring to the “table” 25 years of catering and event planning experience. 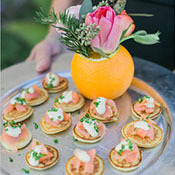 We cater all types of events, from weddings to corporate and non-profit galas, from 15 person dinner parties to 1000 person cocktail parties. Full service catering, from set-up to clean-up, for special events of any size. We also offer delivery and “drop-off” catering, with limited or no staffing. Expert site analysis and rental equipment sourcing. 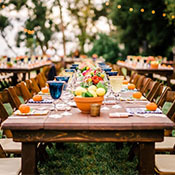 Assistance in arranging all other vendors, including lighting, sound, florals, photography, entertainment, rentals, restrooms, trash haul, and event coordination. 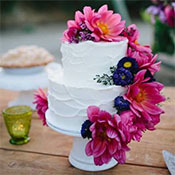 All types of celebrations, including retirement parties, birthday parties, and memorial services.